The pound sign is the hashtag. The definition of a hashtag is the pound mark used after a word in a Twitter post or “tweet” to show that you’re commenting on a specific topic. An example of a hashtag is to write about the president on Twitter and end your tweet with #Obama. "hashtag." YourDictionary, n.d. Web. 10 April 2019. <https://www.yourdictionary.com/hashtag>. A searchable keyword or sequence of characters prefixed with the pound sign (#), included in a tweet or other electronic communication and indicating the subject matter. (Internet) A tag embedded in a message, consisting of a word within the message prefixed with a hash sign (#). (Internet) To label (a message) with a hashtag. A means of providing a common topic identifier in text and chat messages so they can be searched as a group. 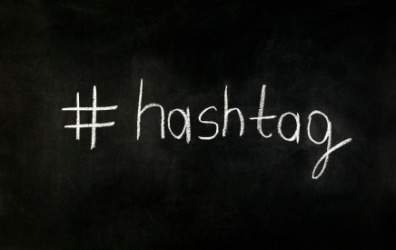 Commonly used in tweets, the hashtag uses a number sign (#) prefix followed by text. Hashtags can be created and used to identify anything, including people, businesses, organizations, sports teams, political parties, hobbies, events, philosophies, moods, rants and raves. For example, the hashtag for the United States Marines is #marines. The athletically inclined might search for #triathlon or #ironman. See Twitter and bashtagging. In this example at the Philadelphia airport, "hashtag worthy" means the trip is worth talking about. Meeting new people is as easy as adding a hashtag to the end of your comments and joining an ongoing conversation with people from around the world. As long as you incorporate a hashtag (#) along with a phrase that contains no spaces between words, you can join a conversation.